Like all triple-keeled Tridents, Lottie has a central ballast keel flanked by two half-inch steel bilge plates. The bilge plates were originally galvanized though much of this zinc has now worn away. The story of Lottie‘s adventures with corrosion and cathodic protection is told here. At the base of each bilge keel is a ski-like horizontal steel shoe which protects the edge of the bilge plate from constant wear when grounding and helps heep her upright aground by preventing the bilge keel digging into soft surfaces. These shoes themselves wear over time and by 2003 Lottie’s were getting very thin. One of the tenants at the boatyard where she then was happend to be a blacksmith and farrier. He fashioned replacement shoes from two lengths of sutiable steel strip and arc-welded them over the top of the originals. 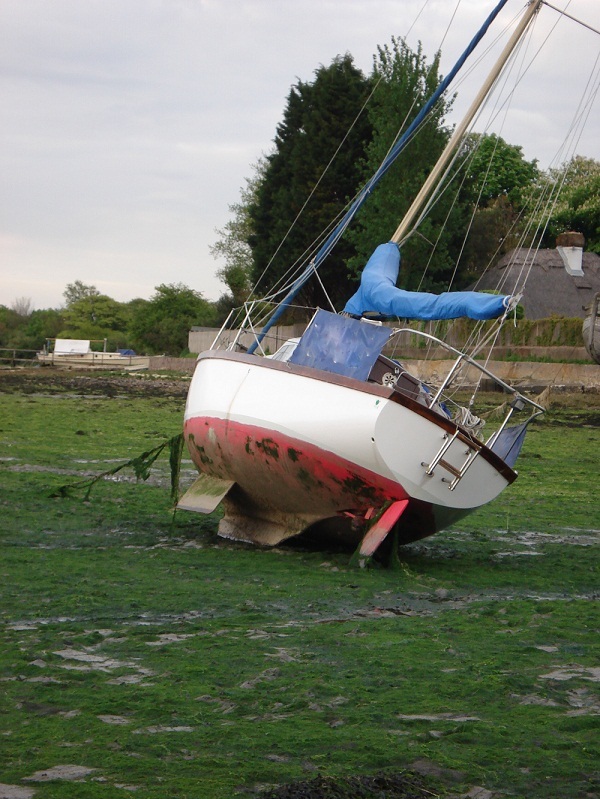 The shoes are primed with International Primocon before antifouling but the constant wear as Lottie grounds twice a day on her gravelly mooring keeps them largely clear of both paint and fouling. 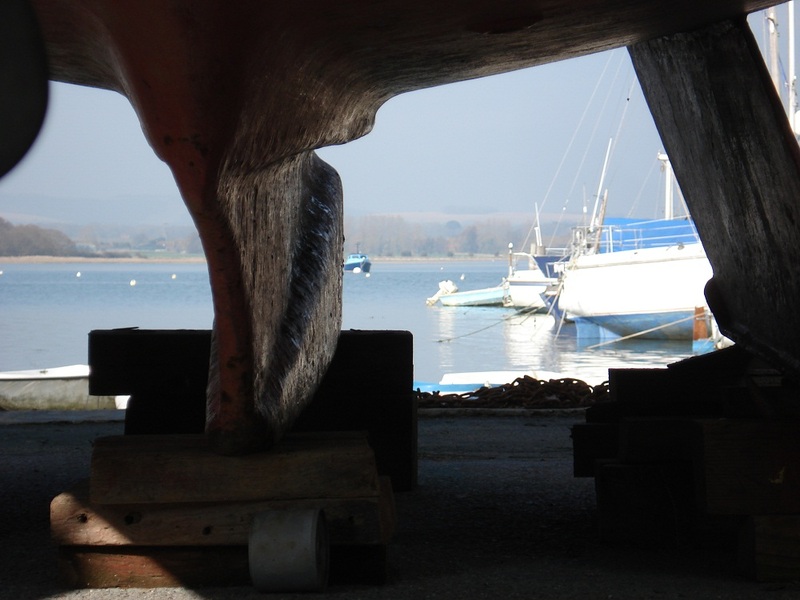 The bilge keels are about one inch shorter than the central ballast keel so on hard surfaces Lottie rocks slightly and requires a wedge under one side if you need to keep her steady. Lottie‘s central cast-iron ballast keel is a disgrace. 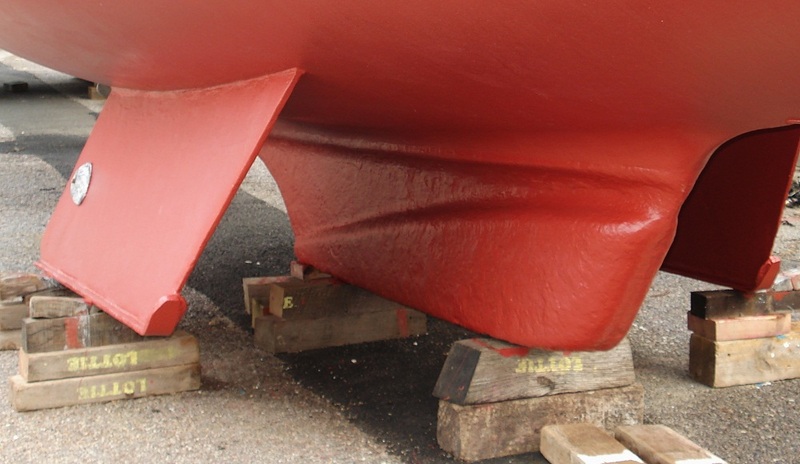 Every year we promise to give it some cosmetic and anticorrosive treatment but in the event all it gets is a lick and a promise – a quick wire brushing followed by yet another coat of antifouling. The result at the end of each season is not pretty but the corrosion is not seriously depleting the cast iron.